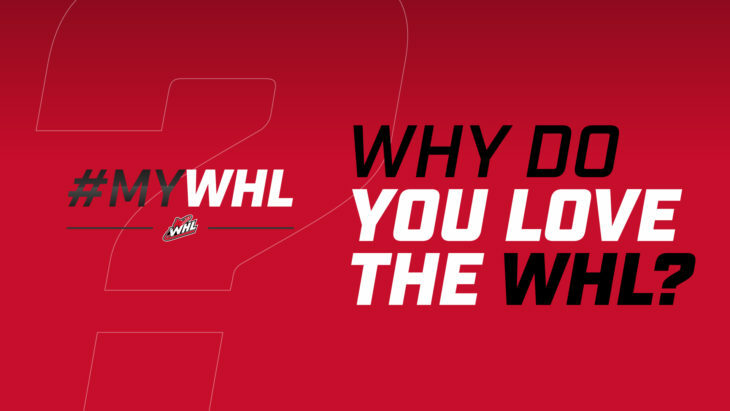 Calling all Western Hockey League fans – we want to hear what it is you love about the WHL! More so, we want to see you engaging with one another in the sort of passionate discussion we all know exists within the WHL community that spreads far and wide across Western Canada and the Pacific Northwest United States. #MyWHL is a social media campaign driven towards bringing together WHL fans across all regions. Ultimately, the passion and dedication of WHL fans is what makes the west best. Post your 30-second video clip to your favourite social media channel – Facebook, Twitter or Instagram. Be sure to mention or tag the WHL and use the hashtag #MyWHL. We encourage you to show your WHL spirit by sporting your favourite WHL gear (hats, toques, jerseys, sweatshirts, etc. ), shooting your video at your favourite WHL arena or in an iconic location in your favourite WHL town. Creativity is encouraged! Let’s show the whole world exactly what makes WHL fans the best! Every week, three lucky winners will be randomly selected to receive great prizing from the WHL! In order to be eligible for prizing, entries must meet the specified guidelines listed above. Upon selection, all winning submissions for each week will be compiled into a supercut video and featured prominently on WHL.ca and all WHL social media channels. Winners will be contacted via the social media channel of their submission. Upload your 30-second video to Twitter. Put together your own unique tweet and be sure to tag @TheWHL while including the hashtag #MyWHL. Share your tweet with the WHL community by ensuring that it is publicly viewable. Upload your 30-second video to Instagram. Put together your own unique post and be sure to tag or mention @westernhockeyleague while including the hashtag #MyWHL. Share your post with the WHL community by ensuring that it is publicly viewable. Upload your 30-second video to Facebook. Put together your own unique post and be sure to tag @TheWHL while including the hashtag #MyWHL. Share your post with the WHL community by ensuring that it is publicly viewable.